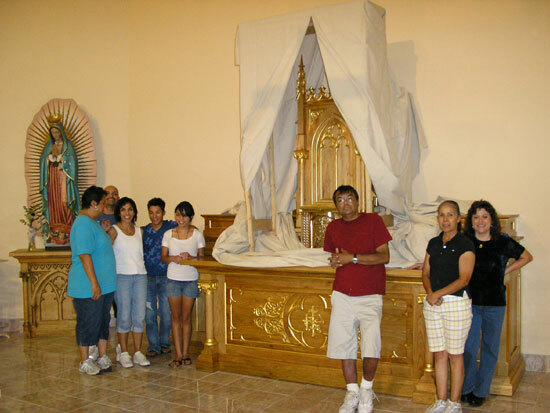 A group of volunteers poses for picture after assembling the main part of the altar which holds the tabernacle. Father Ricardo is checking the list of things to do. The main part is brought to the church to be assembled. Seminarian Christopher Williams is checking the timeline at the “wood shop”. The main niche is being assembled by a group of dedicated and brave volunteers. The Candyman, Steve, and Gloria pause for a photo. One of the side niches is being assembled. Tom was very happy to bring his family to participate in this project. Lunch break. Burrito or Green Enchilada? Patti Pickert and Ann Wright are some of the angels that made this project possible. Even little ones were very helpful in cleaning the brass. Some of the crockets finished and ready for attachment. Derek Rubio participates in a very special way, sharing his talents, and struggling with diabetes and heart failure. Just after the project was completed, he left us to go to the Lord.